The Columbia Gorge Discovery Center & Museum is thrilled to welcome Darryl Lloyd, Friday November 2nd at 6 pm for dinner SOLD OUT!! and 7 pm (program only free STILL AVAILABLE) for a 45 minute narrated slide show. He will be talking about his newly released book Ever Wild: A Lifetime on Mount Adams. Afterwards he will be available for questions and a book signing. If you have ever had the honor of visiting Mount Adams while hiking with Darryl, you will know why we are so excited to have him here. The knowledge, the beauty, the adventure he shares, is unsurpassed. 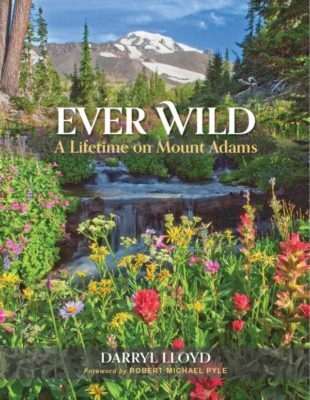 Ever Wild: A Lifetime on Mount Adams offers a first-time, close-up look at Mount Adams. Through a personal journey spanning seven decades, Darryl Lloyd cemented his place in the sweeping story of Washington state’s Mount Adams. As the foremost authority on this northern Cascades massif, a sometimes overlooked, but never forgotten, hulk of a mountain, Lloyd mixes adventure memoir with doses of human history, geography, geology, botany, and a vital call for protection. Darryl first explored the foot of Mount Adams as a toddler on the loose, but he and his twin brother, Darvel, have been earnestly hiking and climbing since boyhood, and they’ve spent most of their adult lives inviting others to join in. Lloyd’s wide-ranging knowledge is highly regarded by leaders in diverse scientific disciplines. For nearly fifty years, he has brought the mountain to the people through talks and slide shows attracting thousands, and his writings and stunning photography have appeared extensively in print. With his brother, Lloyd founded the non-profit Friends of Mount Adams in 2004, promoting protection, scientific research, and stewardship of Mount Adams. Lloyd holds a Master of Marine Affairs degree from the University of Rhode Island, and lives in Hood River, Oregon.